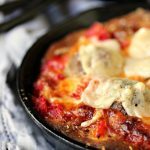 Deep dish pizzas is always a huge hit with family and friends. This recipe is packed full of meatballs and cheese. Big flavour served in mini cast iron pans. Spray 8 mini cast iron pans with non-stick spray. Set aside. Divide dough into 8 pieces. Roll out big enough that the dough fits into the bottom of cast iron pans, plus an extra inch in diameter. Lay each dough in each pan and press so it comes up the side of the inside of the pan. Spoon the sauce into the pans, evenly. Sprinkle in about half of the mozzarella cheese. Add the meatballs, I used 6 to 7 in each pan. Toss diced roasted red peppers in each pan, spreading evenly amongst all the pans. Sprinkle the pressed (or minced) garlic evenly over each pan. Top with other half of the mozzarella cheese. The more the better. Save the parmesan cheese, you'll add it towards the end of the cooking process. Place the cast iron pans in the oven carefully. Place a foil-lined cookie sheet on the rack below to catch anything that may drip over. Cook for about 8 to 11 minutes. Pull out of the oven and add a square of parmesan over each meatball, place them back in the oven and cook for about 3 to 5 minutes more, just enough for the parmesan to melt. Remove carefully from oven. Place a handle cover over each handle, or use a cloth napkin, or small towel. That way no one hurts themselves on the pans. You can serve one to each person, or slice them into pieces. Just warn people the pan is hot. For real! Serve with a big old pizza loving smile!